Albert Gene Chambers, 94, passed away and went to be with his Lord Jesus Christ at 12:21 p.m., Sunday, January 20, 2019 at the Parsons Presbyterian Manor. He was born in North Little Rock, Arkansas on September 30, 1924 the oldest son of Albert Hugh and Thelma Geneva (Waldrop) Chambers. He grew up in North Little Rock and graduated from North Little Rock High School in 1942. He was active in band, debate and the National Forensic League. He volunteered for service with the U. S. Army Air Force serving from 1942 to 1946. He was stationed in several locations from Gander, Newfoundland in Canada to Fairfield-Suisun Field in California. After the war he attended several colleges and universities in Arkansas and Kansas and earned several degrees including a Bachelor of Science in Education, Master of Science in Education and a Bachelor of Science in Aeronautical Engineering. He also attained his Kansas license as a Professional Engineer in 1961. He worked for Beech Aircraft and Boeing in Wichita as an engineer before joining the faculty at Wichita State University in 1966 in the Engineering Graphics program. He left WSU in 1969 to start the Engineering Technology program at Kansas State College of Pittsburg (now PSU). He designed the program and got it accredited. He left PSU for a short time to work for Superior Concrete Accessories in Parsons. He returned to PSU in 1978 staying until he retired in 1991. He also did part time teaching at Labette Community College after he retired. He met Naomi Ruth Holloway in Wichita and they were married at the First Baptist Church in Wichita on April 4, 1954. Ruth preceded him in death on December 13, 2001. After retirement Gene was very active on several boards and organizations in Parsons – the Labette County Solid Waste Board, Parsons Historical Society board of directors, the Parsons City Commission, serving as mayor, and the Labette Community College Board of Trustees. He also served as interim Parsons city engineer. He was active in several community musical activities and was a member of the Parsons Community Band, Tioga Township Dixieland Jazz Band and the Sauerkraut Oompah Band. He sponsored several performances of various musical groups in Parsons. He and Ruth donated funds to assist in the purchasing of a grand piano for the Parsons Municipal Auditorium. They also donated funds for the painting of the MKT locomotive and caboose at the Iron Horse Museum. 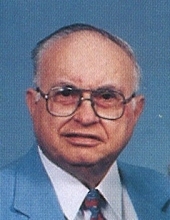 He was a member of the First Baptist Church in Parsons where he served on various committees and taught Sunday school. He was also a member of the Kansas National Education Association, Kiwanis and was a Mason and a member of the Wichita Scottish Rite. He was a member of the Brown-Bishop Post # 704, Veterans of Foreign Wars. Survivors include his children, Dr. David Chambers (Joyce) of Livermore, CA, Dr. Ellen Haig (Robert) of Wichita and John Chambers of Parsons; his sister-in-law, Sue Chambers of North Little Rock, AR and brother-in-law James MacIntosh of Missoula, MT. ; grandchildren, Sarah and Dan Baker of Tracy, CA, Christina Chambers of Livermore, CA and Cameron Haig of Wichita and many nieces and nephews. He also is survived by his “adopted” daughter Charlotte Ecoff (Doug) of Parsons. He was preceded in death by his parents, wife and brother. Memorial services will be at 1:30 p.m., Saturday, February 16 at the First Baptist Church. Burial, with military honors, will follow in Oakwood Cemetery. The family will receive friends at the Carson-Wall Funeral Home from 6 to 8 p.m., Friday, February 15 at the Carson-Wall Funeral Home. Memorials are suggested to the First Baptist Church, Labette Community College Foundation or the Parsons Historical Society. They may be left at or sent to the funeral home at Box 942, Parsons, KS 67357. Online messages may be left at www.wallfuneralservices.com. To send flowers or a remembrance gift to the family of Albert Gene Chambers, please visit our Tribute Store. Memorial services will be at 1:30 p.m., Saturday, February 16 at the First Baptist Church. Burial, with military honors, will follow in Oakwood Cemetery. "Email Address" would like to share the life celebration of Albert Gene Chambers. Click on the "link" to go to share a favorite memory or leave a condolence message for the family.